Anniversary journalism is often expressed as series of lazy tales of seemingly little consequence. Editors feel they need to mark an occasion, and if it has a catchy headline readers may be drawn to the story. But itâ€™s difficult to know what anyone actually gets from marking historical events, beside of course pushing a particular agenda: it is also important to consider why certain events get marked over others. Take World War II. You’d think by the amount of coverage given to historical event, that no bigger wars were ever fought, or no bigger villains than the Nazis ever existed. None of which is true, or even relevant, for human suffering is not one that can be measured by the number of dead bodies alone. Human tragedy is far more complex; remembering the past is not a visit to a gravesite, somber memorials mean nothing if we do not learn from the past. Remembering Sharpeville is not about those who were slain. They are dead, gone; their sacrifice over.Â The story of Sharpeville, or indeed the atrocity at the township of Langa, outside Cape Town on the same day, is really about us today. To remember the events of 1960 explains in part the nature of the ANC and the PAC, as parties that were forced underground. It reminds us that the tense emotions on the streets of South African townships following the killing of 69 protesters in Sharpeville, and three others in Langa, terrified apartheid authorities enough to clamp down violently on any dissent. The apartheid government decided against reforming its laws and instead chose to squash the resistance. The events at Sharpeville illustrated the extent to which apartheid South Africa was willing to go to protect the status quo. Police opened fire and shot dead 69 people and injured 180 others that day, but it was the beginning of mass arrests and detentions; a declaration of a state of emergency in which the security apparatus had the ability to use strong arm tactics in the interests of ‘preserving law and order’. This precise moment gave rise to an armed resistance. Nelson Mandela, the supposed torch-bearer of non-violence, was among its biggest proponents. Four years later, as commander-in-chief of the ANC’s armed wing, he pleaded guilty to sabotage and was sentenced to life in prison. But apartheid was already failing. Dissent was bloodshot. The Pan Africanist Congress, under Robert Sobukwe, who was largely credited for having arranged the protests of 21 March 1960, seemed to know exactly what the people wanted. Nothing changed overnight, of course. The experience of black South Africans only worsened through the â€™60s, and the police state continued to pile pressure on dissidents and their families through the â€™70s. In 1976, another atrocity took place in Soweto, followed by others in the â€™80s, when the regime began to crumble. And with every threat, the apartheid state fought back and attacked the peopleâ€™s dignity.Â This is why Sharpeville is important, and why we choose to remember it today. The story of Sharpeville is not just about the shootings, neither is it simply a story of protest against apartheid, or burning passes. Sharpeville was about taking back dignity from those who wished to own it. It was about systems of oppression and the organic social movements designed to resist them. But that has all been forgotten. Now itâ€™s a case of villains and martyrs. Our acknowledgement of Sharpeville has become lip-service to the fallen, and not a beacon of inspiration to fight for dignity today. As we have seen in the tragic xenophobic attacks in 2008 or the massacre of miners at Marikana in 2012, this historical event has resonance in the type of society we have today. It tells us about our propensity for violence, of harsh police crackdowns and rampant crime in the townships, or of the suburbs that â€œcanâ€™t understandâ€ why people are angry. It also tells us something about the example set by apartheid police and government to our leaders: of how to react in time of dissent. And it tells us a little more about why we have Marikanas, and attacks on foreigners and sexual violence. This is still a country of mostly two halves. For some South Africans, Sharpeville is a historical event that you read about in the papers once a year as Human Rights Day. Others live out brutalised lives on a daily basis. Remembering Sharpeville takes us back to the source. It should not be a day for navel-gazing, but a call to action. 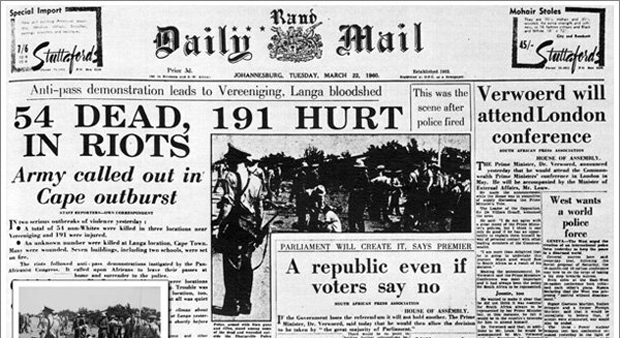 Human Rights Day: have we learned anything since Sharpeville? International men’s day? For who? For what? Our so-called “leaders” had a lot of “examples” to choose from when it comes to their policies (i.e the ones that resulted in Marikana). These atrocities didn’t happen because of some “example” set to them, but because it was in our so-called “leaders'” interests to behave that way. This regime has become exactly that which it was always going to be. And the hypocrisy inherent in the difference between the manner in which these historical events are “celebrated” together with the almost-complete disavowal of more recent atrocities (which they are directly responsible for) is of little surprise to those who never drunk the Kool-Aid.